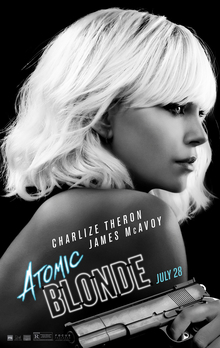 Atomic Blonde is a 2017 American action spy thriller film directed by David Leitch and written by Kurt Johnstad, based on Antony Johnston and Sam Hart‘s 2012 graphic novel The Coldest City, which revolves around a spy who has to find a list of double agents who are being smuggled into the West. The film stars Charlize Theron, James McAvoy, John Goodman, Til Schweiger, Eddie Marsan, Sofia Boutella, and Toby Jones. This will be Leitch’s first solo credit as director, after co-directing John Wick with Chad Stahelski. The film had its world premiere at South by Southwest on March 12, 2017 and is also an official selection at the forthcoming Locarno Film Festival. It will be released theatrically in the U.S on July 28, 2017 and in India on August 11th.